Have you ever stopped to think about how much waste your family puts out each day? If not, take a quick look around because I’m certain that like I was; you will be very unpleasantly surprised. It doesn’t matter what area of your life the waste is in; waste in your home and life equals wasted money in your personal budget. Over the past few months – since my daughter and I stopped living full-time in a hotel and moved back into a home with our new little family – we’ve all made a serious effort to make our home a zero waste home. Granted, it wasn’t easy because learning how to reduce waste is something none of us really think about on a daily basis unless someone is standing over us reminding us. Going zero waste though has had an impact not only in our home and how we live each day, but also in our budget. In fact, I was absolutely shocked at the amount of money we’ve saved! On average, the US wastes 150,000 tons of food each and every day. In case you don’t want to do the math, that is roughly 300,000,000 pounds of food wasted each and every day. That number is three-hundred million by the way. Ya’ll, seriously. That is 300 million pounds of wasted money going into the trash each and every day and accounts for 30-40% of our total food supply. There are people starving all over the world and we’re over here throwing out 30-40% of our food. Now imagine this; on top of that massive food waste, we also waste everyday items such as clothing, electronics, water, power and so on. The list of what our society is okay wasting is almost endless. For our family, going zero waste was sort of our way of saying that enough is enough. We want our money to stay in our bank account longer so we wanted to learn how to reduce waste to save that money. I don’t want to come off holier than thou. If you’ve been a Six Dollar Family reader for any length of time, you’ll know I am very much not like that. If you’re new, please don’t mistake my tone in the paragraphs above as being that. The truth is, that tone you’re reading is shock – pure and simple. It’s one thing to know that you live in a disposable society. It is an entirely different one to look up the statistic and see it in number form like what I’ve done above. 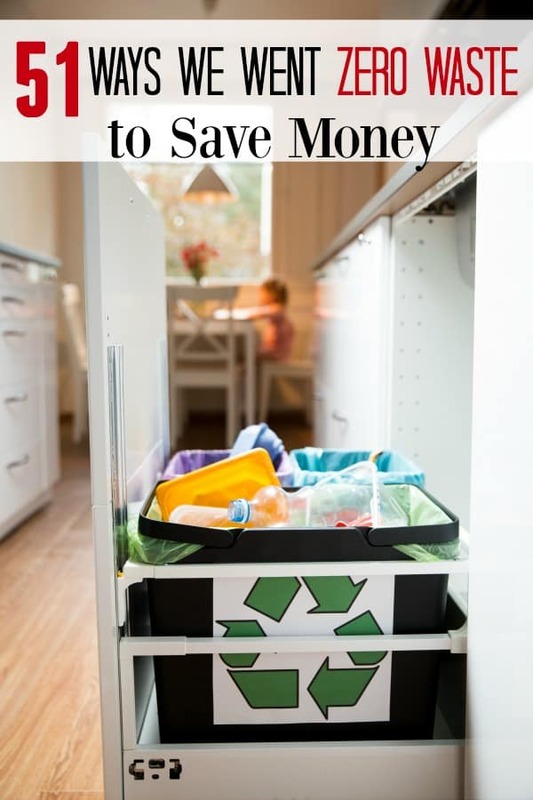 It is one thing to know you can save money by having a zero waste home. It is an entirely different thing to see that savings build in your savings account over and over again each month. Our journey to learning how to reduce waste actually started with me back in 2015 when I created this list of things to stop buying and make homemade. Back then it wasn’t done to save money, but it did. In fact, I saved well over $2500.00 over the course of the first couple of years which floored me. After Emma and I settled down and welcomed Steve and Laura into our family, the adjustment period of having two additional people in my budget and two additional spending habits to contend with meant that I wanted to cut my expenses even more. What resulted was a game of sorts to see how low we could get our expenses and what came from that game was a zero waste home. Before I get into the ways we went zero waste and what we did to have a zero waste home, I do want to clarify something. We are absolutely okay doing the things we do to reduce waste. We don’t mind the extra work and since I work from home and am no longer homeschooling my daughter, I have the extra time. If these won’t all fit into your life, don’t stress it. Simply do what you can and forget about the rest. What works for our life and our home won’t necessarily work for yours and that is perfectly okay. Side Note: Want to work from home like I do? Why not learn how to start a money making blog just like this one with my FREE 7-Day blogging e-mail course! In just 7 days, I’ll show you how to create a blog from scratch, get traffic to it and make money! Sign up HERE and get started today! Want to skip ahead? 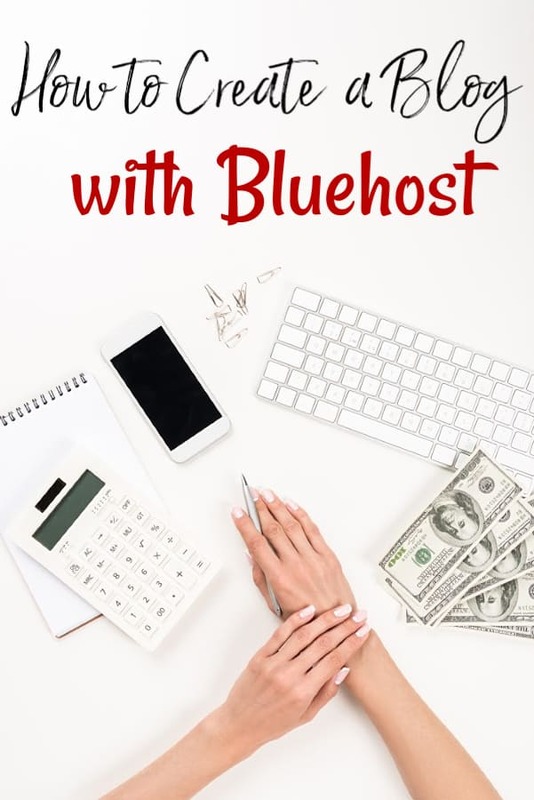 Head over HERE and learn how to start a money making blog in under 15 minutes! Like a few other posts we have here on Six Dollar Family, this one will be long. If you don’t have time to read it now, pin it for later or bookmark it to come back later and finish. One of the first things we did when we were starting our journey to zero waste and one of the easiest for you to do is to replace plastic disposable water bottles with glass ones. We bought THESE glass water bottles and haven’t looked back. We are big into having a garden on a budget to help feed our girls foods that we know are healthy and grown without chemicals. We use an organic fertilizer recipe that we mix up ourselves and around 90% of our produce waste goes into our compost pile. If you aren’t currently composting, learning how to start a compost pile isn’t hard and is well worth the time. Our compost pile saves us both time and money and generally helps us to have a larger, more bountiful harvest each year. My pittie is my baby and because I want her to be as healthy as the rest of us, I tend to make her dog food as often as possible. Egg shells, while compostable, are sometimes kept aside to be ground up and added to a batch of homemade dog food. The shells add calcium to her food and as long as I grind them finely in a coffee grinder, she never notices they are there. Did you know that you can regrow certain vegetables from scraps? Celery is easy to regrow from scraps as are potatoes and carrots. When we first started looking at going zero waste, learning which vegetables can be regrown from scraps was one of the first things we did. Not only does it cut down on waste, but it also helps us save money on groceries. One of my favorite ways to use old t-shirts is to make these DIY fabric softener sheets. They’re super simple to make with just t-shirt strips, white vinegar and a couple of other ingredients. There are quite a few different ways to use old denim including THESE denim coasters. I just can’t toss an old pair of jeans and instead choose to use them in a way they aren’t wasted. A few years ago, I made the switch to cloth pads from disposable and I have never looked back. These days, I use old towels and old sheets to make my own homemade cloth pads. There are so many ways to use old towels and ways to use old sheets and since both become a different part of the pad which means I can really make the craft a zero waste craft! If you’re interested in making the switch yourself, my favorite cloth pads are TreeHugger Pads found HERE. I would recommend trying a few from them to make certain you’ll like them before you start making your own. Somewhere along our journey to learn how to reduce waste, we stopped buying as much plastic as we could. Instead, we buy things in glass containers if possible. This may seem hard, but we already have a huge list of things to make homemade that we have stopped buying so it was made easier. I didn’t toss all plastic in our home. Instead, I added those bottles and containers our list of things to reuse to save money and just reuse them. When I no longer can, I toss them into the recycling bin. As I said, we try to buy glass and since I believe in being prepared for emergencies, I have several antique oil lamps and several modern oil lamps for use if we ever have an extended power outage. These lamps run on lamp oil but you can’t store lamp oil in the plastic containers it comes in for very long at all. Instead, one of my favorite ways to use old bottles is to use them to store the lamp oil. I paint each bottle grey to make them easily identifiable and mark it as oil, fill and put the cap on. Easy storage! Have you ever had homemade green beans with bacon grease added? How about eggs fried in bacon grease? There is just something soul-soothing about bacon and it’s grease. Because we are aiming for zero waste in our home, I strain all our bacon grease into a mason jar using cheesecloth and use it to flavor other dishes. It keeps the grease from going into the trash and helps me save money on buying shortening or oil. One of the first things I wanted to try when we first made the decision to have a zero waste home was rendering lard. To do this, I started saving any fat from chicken (before its cooked, of course) we used for dinner. Turns out, it’s a fairly easy process and saves me money on my grocery bill! Chicken fat isn’t the only fat I will render into lard. I also save beef and pork fat as well! Pork fat is the easiest to render, but they all work well if you watch them. Beef fat that has been rendered is technically called tallow, but it is basically the same thing. I save any and all beef bones we get (including steak!) to turn into homemade beef stock! In addition, I’ll watch the clearance sales at my local stores and can often pick up beef femur bones to add to what I already have for under $1.00! I not only save beef bones for stock, but chicken and turkey bones get saved as well. They both make amazing stock and since I have it made homemade, I don’t have to buy it. In addition to egg shells, I also add the bones that I use to make stock with to our homemade dog food. Now before you go getting on me about adding bones, by the time they are added to the stock, they have been boiled so many times and for so long that they are truly soft and mushy. Once I’m done using them, I run them through my Ninja blender to make sure there aren’t any large pieces and that the only part going into her food is the marrow. One of my favorite sewing projects is this DIY kitchen towel. It also happens to be one of my favorite ways to use towels since it means I can use them in helping to reach our goal of being zero waste! Another one of my favorite ways to use old t-shirts is to make homemade rope toys for dogs! My pittie loves them and since they’re made entirely of upcycled material, I don’t really care much if she goes to town on it and destroys it! We love corn on the cob, but the cobs are kind of hard to compost since they take so long to break down. Instead of wasting them though, I make my corn cob jelly recipe found HERE. I know it sounds a bit disgusting, but trust me when I say it is amazing and tastes just like honey! Once my corn cob jelly is made, I don’t toss the corn cobs. That wouldn’t be working toward my goal of a zero waste home. Instead, I dry them out evenly and we use them as homemade fire starters when we go fishing and camping as a family. Orange peels mostly go into our compost pile, but when I get close to running out of homemade all purpose cleaner, I use them to make this homemade orange cleaner. It’s a super simple homemade cleaner recipe that works better than anything store bought and smells amazing! I love the smell of oranges and orange peels are great in this homemade fall potpourri recipe. All you need is a medium sized saucepan and the ingredients! If you’ve never had apple scrap jelly, you’re missing out! It uses both apple peels and cores which means zero waste! Or you can use your apple scraps to make homemade apple cider vinegar like THIS recipe. The homemade orange oil cleaner that I use orange peels for can also be made using lemon peels. I compost about half of mine and use the rest for the cleaner. I do a lot of my shopping online and as such, I get a lot of cardboard boxes. We compost all of the ones we can and recycle the ones we can’t. Side Note: If you shop online a lot too, be sure to sign up for an Ebates account before you shop. Ebates is a cash back shopping site that will pay you cash back on qualified purchases. Plus, Ebates will give new customers $10.00 in FREE cash back when you create an Ebates account and make your first qualified purchase of $25.00 or more. You can check them out HERE. Still confused about how Ebates works? Be sure to check out my Ebates 101 post right HERE. There are so many ways to use newspaper that it almost seems a shame to simply compost it, but the majority of the time, that is what happens at my house. I absolutely love to shop thrift stores in case you haven’t noticed by how often I post thrift store shopping tips, but did you know that I rarely buy anything new? Instead, I would rather buy used if possible to not only save an item that still has life in it but also to save myself money and pad my savings account. A good, quality cast iron skillet may cost more than a regular one, but if you take the time to learn how to care for cast iron, you’ll save money and learn how to reduce waste at the same time. Since cast iron keeps for generations, you won’t be putting out older pans year after year when they need replaced. Most of the time, I use reusable shopping bags when I go to the store but there are occasions where I forget them at home. In the event that I end up with plastic or paper grocery bags, we reuse them. Plastic bags get used as trash bags in our bathrooms and paper ones get composted as long as they don’t have too much colored ink on them. We don’t often have bread left over except the heels. Unfortunately no one in my home prefers them. Instead of allowing them to go to waste, I stick them in the freezer to keep them fresh. I just use an old bread bag to keep them, but once that bag is full, I run them through a coffee grinder, add a few seasonings and make homemade bread crumbs. Once I’ve got them made, I pop them back in the freezer in an airtight storage container and use them as needed. One of my favorite quick bread recipes is my banana nut bread recipe or my banana pancakes recipe. To keep our kitchen zero waste, I freeze bananas that have gone brown to use for these recipes. The banana gets made into the bread and the peels get composted. Wasted meat is one of the biggest wastes in a grocery budget and that doesn’t always occur with food that has been cooked and then wasted. Instead, freezer burn is a bad culprit for wasted meat. To help curb our meat waste, we started using THIS Foodsaver to seal our meat better. If you package your food correctly with a Foodsaver, it will last for months and help keep your home zero waste. To be honest, my family doesn’t often have leftovers but when we do, they get eaten. They either become lunch the following day or they become part of a leftover buffet once a week. I’ve actually been known to refuse to cook a new meal if we have leftovers left in the fridge. Wasted food is wasted money and I like ot keep my money right where it should be; in my bank account. As I’ve already admitted, I love to shop at thrift stores and as such, I see no reason to buy new furniture when we need it. What I do instead is buy something I can restore. Not only am I not wasting money, but I usually am learning a new skill such as how to reupholster a chair. Another thing I like to do with old jeans is to make them into reusable bags. They can be made into drawstring bags like THESE or even into reusable shopping bags. Either way, if they’re made correctly, they’re very sturdy bags that I’m sure you’ll love! This is one of my all time favorite ways to use old sheets, hands down! Pillow case and sheet dresses are adorable and super easy to make. If you don’t have a little girl, you could even make them and sell them to make extra money. Zero waste and a new way to earn money from home! Even though we grow as much food as we can, we do have a stockpile of commercially canned goods for when we run out of food I’ve canned myself. Because I don’t like throwing anything away, we reuse tin cans as seed starters so we can keep our garden on a budget instead of allowing it to cause us to overspend. We don’t often buy k-cups too often these days since I picked up a couple of these reusable k-cups, but when we do buy them – usually for a change of flavor or a special treat – we reuse the empty k-cups as seed starters. Seeds get started in the K-cup and then moved onto tin cans when they’re big enough and finally moved into the garden when they’re ready to transplant. I know I’ve already touched on how to regrow vegetables from scraps, but I wanted to give potatoes a special mention. I haven’t bought potatoes at all since we started learning how to reduce waste. Instead, we compost any peelings we have from dinner and use potato chunks that have grown “eyes” in storage to plant new ones in clean trash barrels or laundry baskets. Believe it or not, we harvest plenty for our family to eat. Fish stock isn’t something we use often, but occasionally I make a recipe that calls for it. Since Steve and I spend a lot of time fishing for food to lower our grocery budget, we usually have a plethora of fish bones left over after we filet our catches. Keeping with our goal of becoming a zero waste home, we use these bones to make fish stock and the freeze it until it is needed. Making fish stock is a bit different than making chicken, beef or turkey stock in one major way. With chicken or beef stock, you can reuse the bones until they’re basically mush. Making fish stock, you only use the bones once. So when we have made our fish stock or we have leftover bones, I will cook them until they are mush and make them into homemade cat food. I use the water they boiled in – since it is a weaker fish broth – as the liquid for my homemade cat food after straining it through a fine mesh strainer to remove any tiny bone pieces. In short, there isn’t much of the fish that goes to waste and what does gets used as bait for catching more fish. Another way that we use old towels (and t-shirts and sheets) is to cut them up as cleaning rags. Since we fish, camp and spend a lot of time outdoors, we can always use rags that aren’t going to be used to clean our home or our bodies. We wash and reuse these cut rags until we can’t any longer and only then do we throw them out. There are a lot of ways to use empty milk jugs but one of my favorites is to use them t make automatic watering systems for my plants. They’re super easy to do and keep me from having to go out and water everyday. It also keeps me from over watering since the water is only released when the plants need it. Have you ever seen the sandwich boxes or lunch boxes made from milk jugs? I think they’re super cool and if I come across a spare milk jug that isn’t needed elsewhere, I’ll make them for the girls to take to school. Did you know that you can make strong bricks made out of newspaper? When we have extras that we don’t compost such as brightly inked sales ads, we shred the paper and make them into papercrete bricks. They’re great for starting a fire that you want to burn for a long time such as when we go camping. I know this is a strange one, but cardboard egg cartons (not Styrofoam) and dryer lint make amazing homemade emergency candles when they’re covered in paraffin wax.We keep these emergency candles on hand as one of our ways to prepare for power outages and stay within our goal to be a zero waste home. If I do have Styrofoam egg cartons, I reuse those as well since I prefer to buy farm fresh eggs most of the time. I save those so that the person I’m purchasing from doesn’t have to use their own stock. Usually, I get a discount for doing bringing my own. Have you ever seen a book safe? If not, it is exactly what it sounds like; a hidden compartment cut into a book. When we’ve all read a book so much that we want to get rid of it, we upcycle that book into a book safe. Then, we either use it to hide our own items or sell them for extra money. Another way to get rid of old books without wasting them, is to sell your old books at Swap.com. This way, someone who wants to read the book can purchase it for a small price and you make a little bit of extra cash. Side Note: Looking for other ways to make money from home? Be sure to head HERE and check out these home business ideas to help you stop living paycheck to paycheck. As much as we don’t like to purchase anything in a plastic container, it happens unfortunately. We recycle what we can, but the majority of them end up being reused. While most get used to hold tings on my list of things to make homemade, another way we use them is to use them as traveling safes. Most have openings wide enough to hold small items such as cash or jewelry and since the average person won’t look twice at a bottle of sunscreen or shampoo, our items are kept a bit safer when we’re traveling. Broken glass, especially colored glasses, make for amazing home decor or patio decor when they’re pieced together in a mosaic. I keep a box of broken glass in my laundry room (out of the way, of course) and get artsy when I have enough. I’m real big on using thrift store finds as a base for my upcycled glass decor. Finally, one of the first things we did when we were learning how to reduce waste was to start harvesting seeds from the produce we eat. Things such as tomatoes, peppers and the like all produce seeds that can be planted and harvested. Learning how to start seeds isn’t hard and starting our garden with harvested seeds allowed us to do it on the cheap without having to spend much out of pocket.